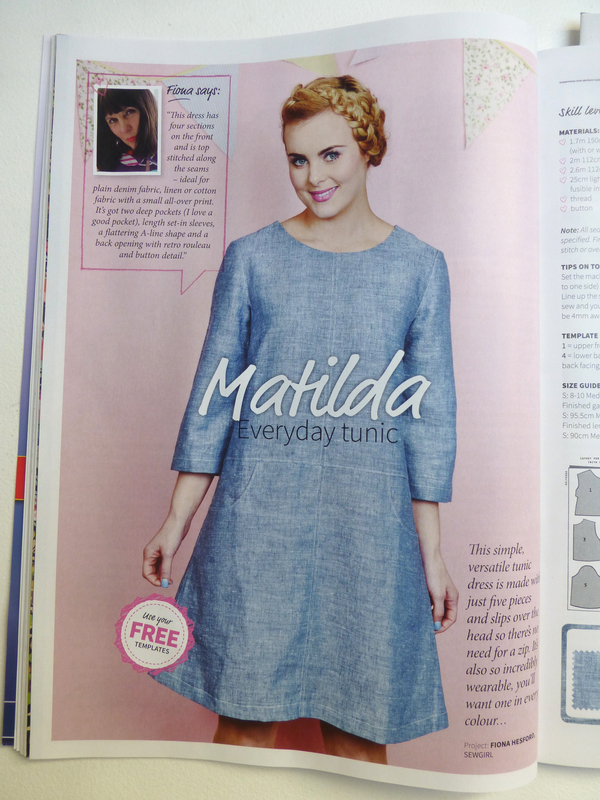 Almost as soon as the latest issue of ‘Love Sewing’ magazine landed on my doorstep, I knew I was going to make the ‘Matilda’ Everyday Tunic with the free pattern (included). Of course, I chose something a bit more eye-catching than the boring neutral denim – well, I do like a bit of Lime Green and Orange! After this photo was taken I took the side seams in by another four inches as I realise my body looks quite ‘square’ – it was just too big at the waist. Although it is a very simple shape, there is some shaping in the form of side bust darts. Darts can be tricky so do them carefully to make sure they lie flat and don’t pucker at the point. The design called for a single rouleau button loop at the back neck. I rarely wear my hair up so this little detail would have been hidden under my hair, so I recreated it at the front neck instead. 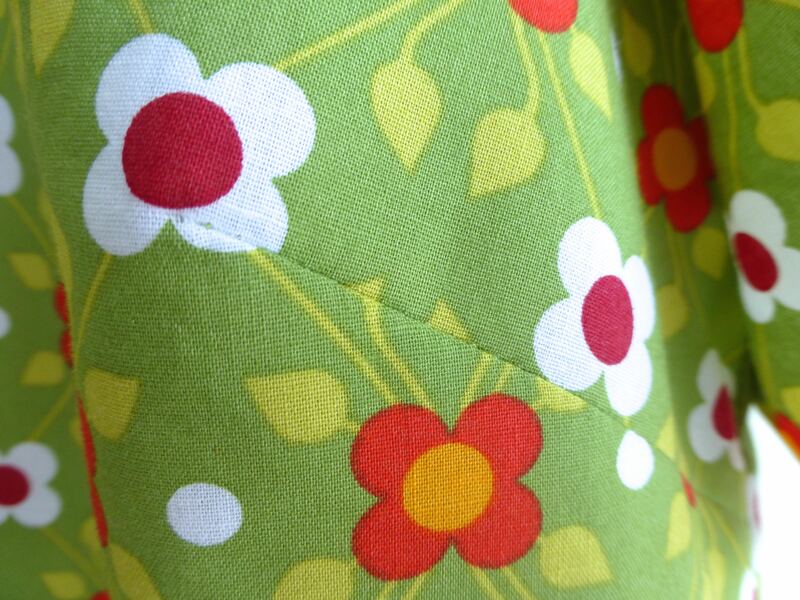 ….and a flat fell seam for the shoulder seams. I just love how neat this type of seam looks and feels! 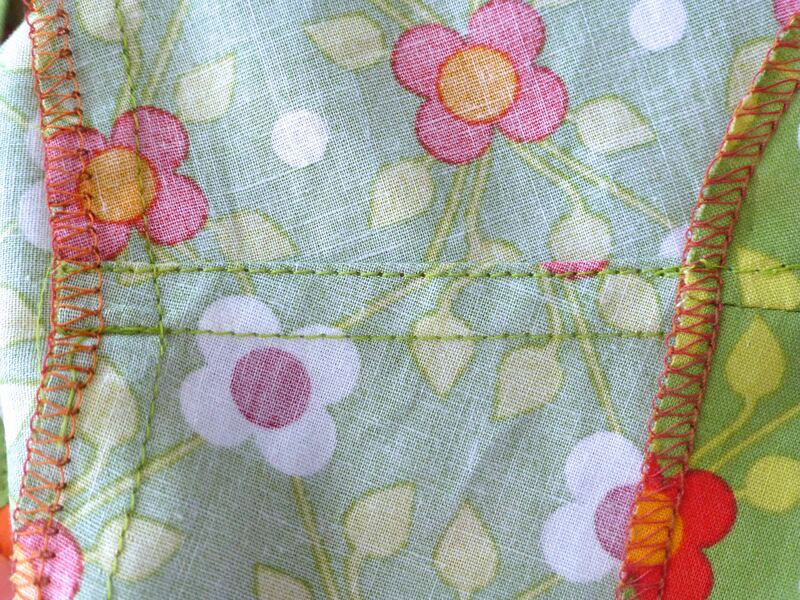 I was about to turn up a plain hem when I remembered some bright orange bias binding left over from a previous project. It lends the perfect designer touch to lift the tunic out of the ordinary. What do you think? It certainly shouts “Summer is coming” to me! 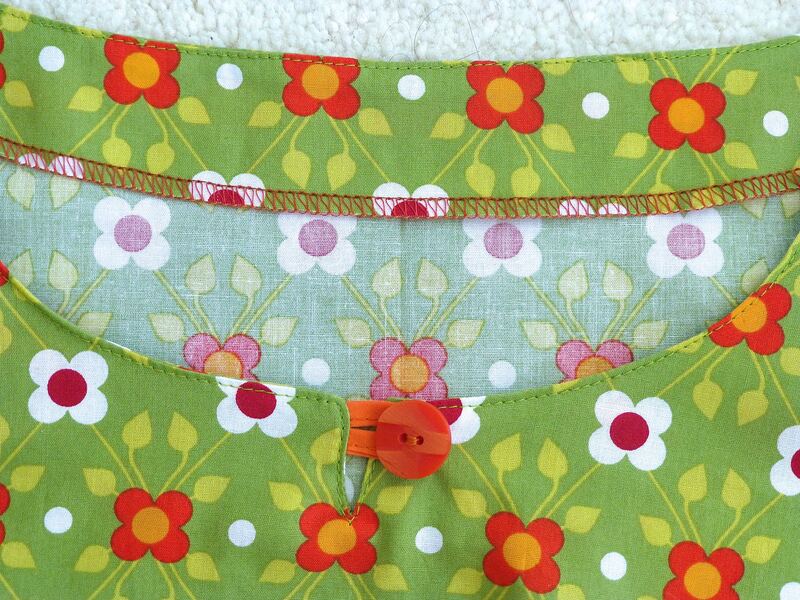 Categories: Sewing | Tags: Matilda Tunic, sewing, summer dress | Permalink. Sewing, Crochet and other loveliness! Thank you, it’s a good everyday staple for me, I think. I like it a lot!! And yes,I’m so very jealous of yours sewing skill…. bias ribbons, circular sewing, darts are a mistery to me…. only straight seams are accessible to me…. You may well be right – I wore it yesterday and it was so comfy. I would have to make them look different to each other though, customise it in some other way. Would feather boa trim be too much do you think?!!! Love it and all you’ve done to it. Originally I thought this pattern wasn’t for me but you have shown me it could. Hope you forward a pic to the mag. hehe, I could do with a dress like that too!! 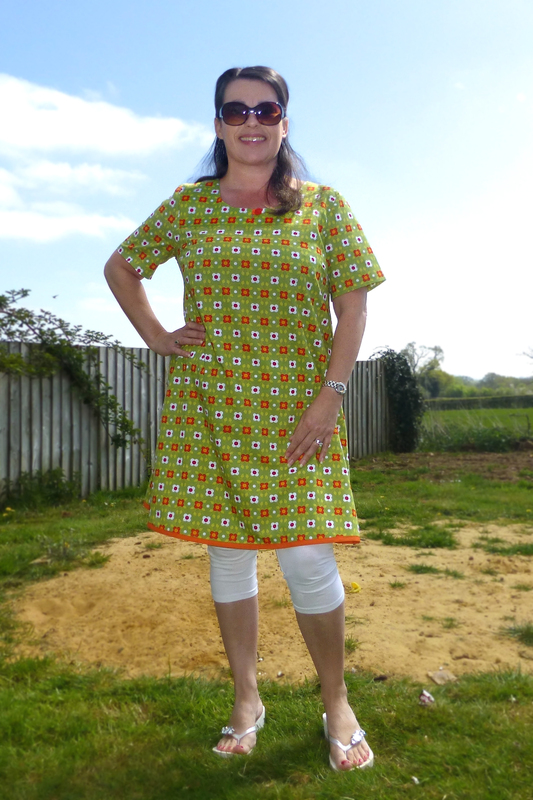 I do love a forgiving tunic shape! The fabric is fun isn’t it? So ‘me’! Yours is definitely more inspiring than theirs – you were right first time with the boring bit! Love the orange trim. I bought some bright orange and bright pink on the spoolette trip, you just never know when you’ll need a splash of colour! I made a two-tone dress about twenty years ago which was Coral and Mauve – clashing colours seem to be making a comeback so your Orange and Pink would be perfect together! Wow! That was super quick! My copy only came through the day before last. I’d dismissed this outright, but you’ve really made it work for you 🙂 Love the zingy colours and Orangina bias binding. You’ve really made this your own, great job! The magazine arrived in the morning and I had finished the dress later that day. I need the skimming shape to disguise my belly (which looks a little worse for wear after five pregnancies) whereas you definitely don’t! So cute! I can definitely see that being a comfy, relaxing summer time outfit! Fantastic! Pillowcases are great for beginners because they give you quick results which is very motivating. The model reminds me of ‘Heidi’ from years ago. 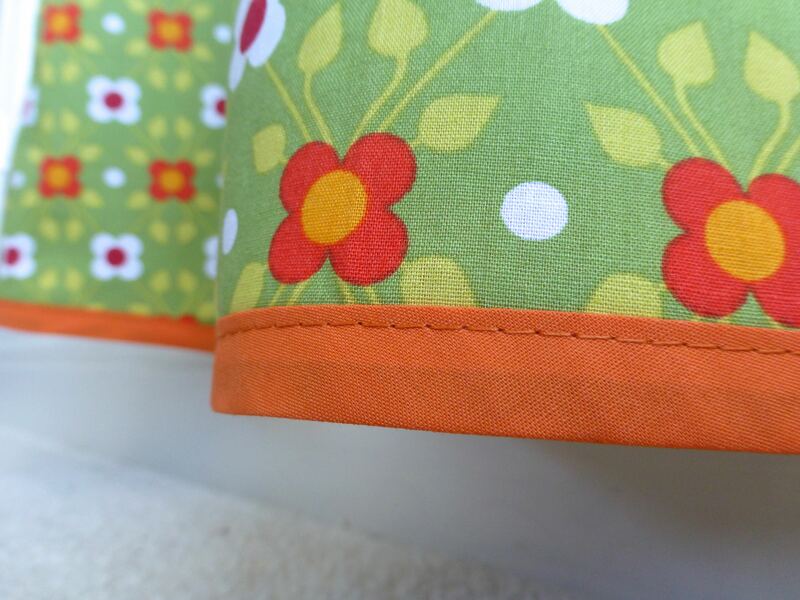 I do love a nice, bright fabric and Orange and Green are unusual choices so should be different to what most people are wearing. I love handmade because you can be sure that nobody else will turn up in the same thing! Wow we couldn’t lose you in a crowd! So colourful 🙂 You’re sewing is absolutely perfect. I’m not sure how much of the original dress pattern you actually followed?! Is there no end to your talents? Very summery! 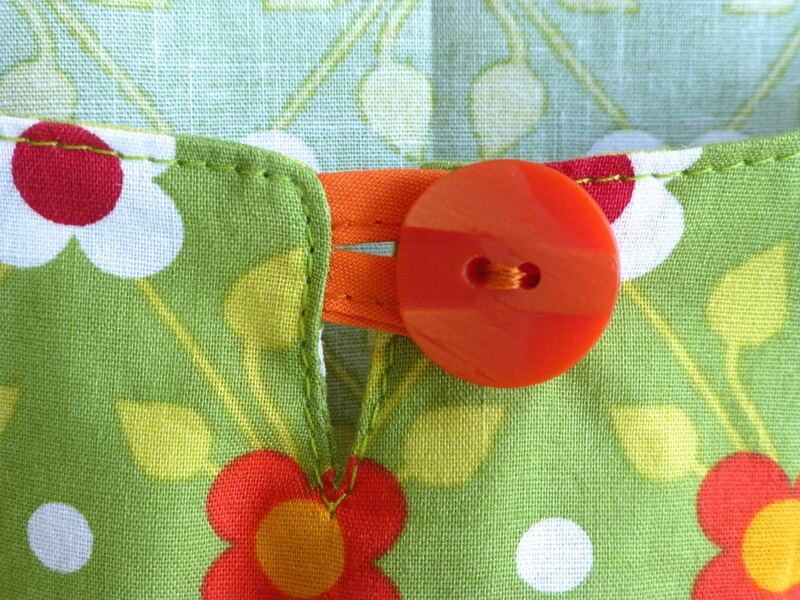 I love what you did with the pattern, and seeing your fabulous sewing skills! Looks so cute on you! Lovely, it really suits you!!! I like to make clothes aswell!! you can find pictures on my blog! This looks great and I actually think yours is much nicer than the one on the magazine! Just the kind of dress I like to wear to work, you’ve inspired me. “Sew Retro” Bag PDF Pattern – Buy Now!